The Netduino ecosystem should more appropriately be called the .Net Micro Framework (NETMF) ecosystem. The .Net Micro Framework is an open source subset of the .Net Framework created by Microsoft. NetDuino boards have the same pin configuration as the Arduino Uno, and are compatible with a large number of Arduino shields. The NetDuino is manufactured by Secret Labs LLC based in NYC. Secret Labs also hosts an active support forum. 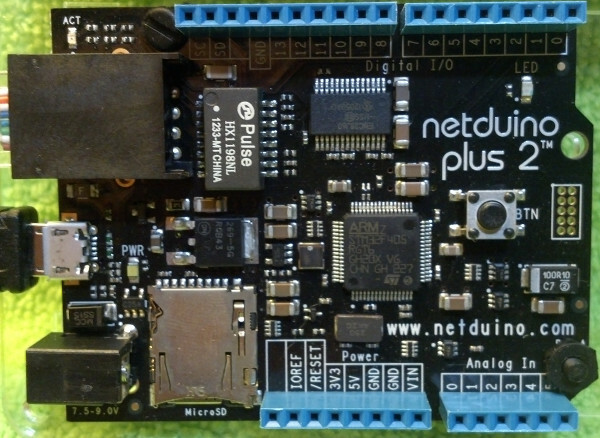 The full range of NetDuino hardware can be found on the NetDuino website. Additional NETMF hardware is available from GHI Electronics, including the Cerbuino. The Cerbuino is also compatible with Arduino shields. Most NETMF boards use a member of the STMicro STM32 family, or another ARM Cortex-Mx MCU. Despite using more powerful hardware NetDuino and Cerbuino boards are cost competitive with AVR based Arduino boards. The real strength of the NETMF ecosystem is the .NET framework, and the Visual Studio IDE. Visual C# is the preferred development language. Visual Basic is also supported but to a lesser extent. Microsoft Visual Studio Express is available as a free development environment from here. The .Net Micro Framework is a comprehensive well documented development environment. The base documentation is provided by Microsoft and can be found here. This is a real advantage, in many other microcontroller development ecosystems documentation is inconsistent and functionality fragmented across multiple libraries with varying levels of support. NETMF contains support for advanced features not usually found in the base versions of other microcontroller ecosystems, such as: http servers, http clients, file access, XML, GUIs, firmware updates, communication protocols, etc.